If you’re having a wedding at home, chances are you’re already a big fan of the beauteous bounty that nature provides. 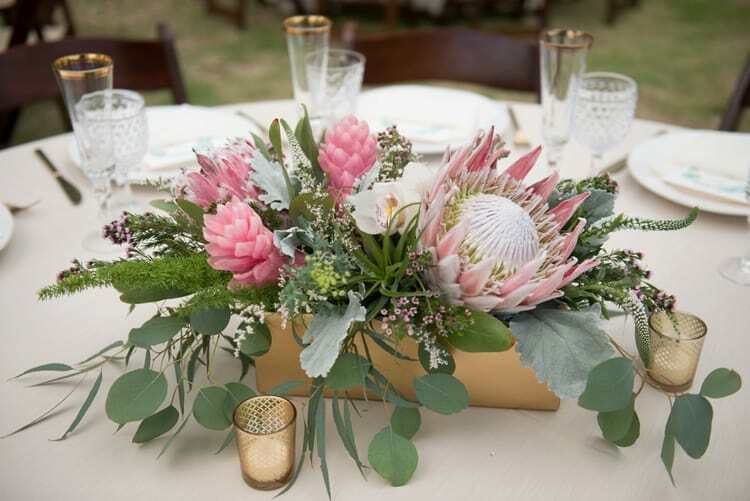 Take advantage of the natural gifts of any season to create unique and stunning homemade wedding centerpieces that will be admired and remembered when you send wedding invites with photos. Here are some ideas to get you started. Stark branches or branches with just a handful of leftover autumn colored leaves or new spring leaves provide a minimalist-themed centerpiece that looks effortless. Showcase branches in tall narrow vases. Let the branches reach high, and add in a few hand-selected fresh flowers nodding out near the rim. Make the arrangement sparkle by adding a couple faux beaded stems, which you can find at fine craft stores nationwide. Hang a cord between two walls and fasten securely. The walls should be fairly close together so the dip in the middle doesn’t need to be supported. Wrap the vine loosely around the cord. Add some pieces such as ornaments like bells and flowers to add interest and to help conceal the cord. Position a trellis near the doorway to your wedding venue. Wrap the vine up, over and down the other side of the trellis. You can add craft flowers, and other wedding notions anywhere you like on the trellis to make it extra magical. For a beautiful lighting effect, intertwine twinkle lights into your vine display. The final look will be dazzling. One of the simplest ways to make centerpieces with nature’s cornucopia of bounty is to use colorful leaves in the fall or fresh green leaves at other times in the year. You can achieve stunning displays in a myriad of ways, but here are two to try right now. Purchase an ordinary round fish bowl from a craft store. Line the interior sides with broad leaves that have beautiful fall colors. Place a tall pillar candle in the center. Hold the leaves in place while you fill the middle with glass beads that surround and stabilize the candle. Now you have a gorgeous (and safe) candle centerpiece that you can place anywhere in your wedding venue. For this next idea, choose leaves with longish stems attached. Buy a Styrofoam half circle (the kind that sits flat, and has a dome on top). You’ll need lots of leaf stems to insert into the Styrofoam and fill it in so it looks plentiful – not sparse. This arrangement is especially attractive if placed on a buffet table, or on opposite sides of the gift table. Now you can see how easy and inexpensive your homemade wedding centerpieces can be when you use the natural materials that are all around you. Better than store bought, these centerpieces will be all the more special because they are handmade. Previous How to choose a dentist to deal for oral problems?